"What if I say the wrong thing?" "I'm white--is race really something I need to talk about? I'm worried I'll be called a racist " "What does race have to do with faith, anyway?" "Why do we have to keep talking about this?" If talking about racism makes you anxious, afraid, or even angry, you're not alone. 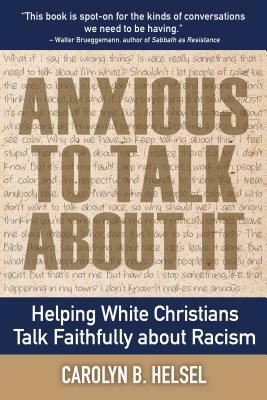 In Anxious to Talk about It, pastor and professor Carolyn B. Helsel draws on her success with white congregations to offer insight and tools to embrace, explore and work through the anxious feelings that often arise in these hard conversations. Through powerful personal stories, new observations on racial identity development, and spiritual practices to help engage issues of racial justice prayerfully, you'll gain a deeper understanding of race in America and your place in it. You will learn how to join conversations with courage, compassion, and knowledge of self, others, and the important issues at stake. Helsel's guidance will inspire you to receive the gifts that come through these difficult race conversations and point to how you can get further involved in the important social justice work around race relations. Each chapter ends with questions for reflection and discussion to further help you get the conversations started. While Anxious to Talk about It can be read alone, reading with a group will deepen the discussion, integrate the material, and provide opportunities to practice. A free Study Guide and other group resources are available at www.chalicepress.com. Carolyn B. Helsel teaches preaching at Austin Presbyterian Theological Seminary and is a minister in the Presbyterian Church (U.S.A.). She holds a PhD from Emory University and MDiv and ThM degrees from Princeton Seminary. Native to Texas, she is currently studying the experience of Texan identity and how that relates to race. Helsel has been featured on Austin's NPR radio station and in The Presbyterian Outlook, and has led workshops for the White Privilege Conference and Festival of Homiletics. She is a sought-after speaker and preacher at churches around the country.